During the early morning hours of October 25th, 2015, an individual explained that he was walking on W. Union St and that was the last memory he could recall. When he awoke in front of the Smiling Skull, the victim was covered in blood and several of his personal belongings had been stolen. The victim required medical treatment as a result of the incident. 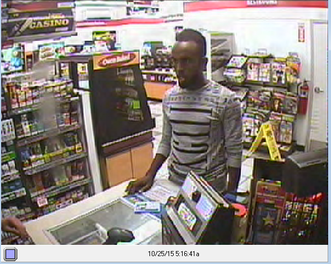 A possible suspect in this incident is shown in the November 2015 photos below. The Ohio University Police Department is requesting your information pertaining to a series of criminal acts which have occurred on the Ohio University campus. Athens County Law Enforcement Agencies are requesting your information pertaining to a series of ongoing car burglaries within the county. The following incidents have been listed by Athens County Crime Solvers Anonymous as November 2015 Crimes of the Month. The Athens Police Department is requesting your information pertaining to two criminal acts which occurred within the City of Athens. Between October 22nd, 2015 and October 23rd, 2015, the owner stated his silver 1992 four door Jeep Cherokee, bearing Ohio registration GEZ-4408, was parked in front of 283 Fort St. When the owner returned to the vehicle on the morning of October 23rd, it was no longer where he had parked it. The following incidents have been listed by Athens County Crime Solvers Anonymous as October 2015 Crimes of the Month. The Athens Police Department is requesting your information pertaining to a series of criminal acts which occurred within the City of Athens. Between 2:30 AM and 3:30 AM on September 15th, 2015 an individual was walking on University Terrace near Memorial Auditorium when this person was approached by several black males. One of the black males physically assaulted the victim, causing valuables to fall to the ground. Upon bending over to retrieve the items, the black male again assaulted the victim, and one of the other black males stole the valuables. All of the black males then fled the area. Between 11:00 AM on August 1st to 7:30 AM on August 3rd, 2015, the perpetrator(s) forcibly entered TSI Housing located at 36 S. Court St. Once inside the business, the perpetrator(s) rummaged through offices and storage areas looking for valuables. The perpetrator(s) were able to get away with money and two laptops. The following incidents have been listed by Athens County Crime Solvers Anonymous as September 2015 Crimes of the Month. The following incidents have been listed by Athens County Crime Solvers Anonymous as August 2015 Crimes of the Month. The Athens Police Department is requesting your information pertaining to two seperate criminal acts which occurred within the City of Athens. On May 4th, 2015 at approximately 5:30 AM., residents of 117 E. State St, the Theta Chi fraternity, were awakened by the sound of smoke detectors sounding and the residence being filled with smoke. All residents and guests were able to exit the residence without anyone suffering injury. After the blaze was extinguished, officers and Firefighters surveyed the scene and noticed signs which made it appear suspicious in nature. Vehicles parked in the parking area to the rear of the residence were also damaged near the time of the blaze. On June 20th, 2015 at approximately 2:00 AM., a woman was walking in the parking lot at the rear of 19 E. Carpenter St and shortly after traversing this lot, an unknown white male approached the victim from behind. While in the poorly lit area, the male attacker grabbed the victim and wrestled her to the ground. The attacker was then scared away by individuals approaching the area. The direction the attacker fled the scene is not known. The victim described her attacker as a white male in his early twenties, 5’8” to 5’9” tall, weighing approximately 160#, wearing dark clothing and a dark ball cap. The Athens County Sheriff’s Office is requesting your information pertaining to a criminal act which occurred in Athens County. On June 6th, 2015 at approximately 3:30 AM., Sheriff Deputies were dispatched to 2370 Blizzard Ln, the Family Dollar store in Albany, after receiving a call of an activated intrusion alarm. Upon arrival, Deputies found damage to the building and it was apparent it had been illegally entered. The safe, containing an undisclosed amount of money, was forcibly removed from the interior of the building and the suspect(s) left with it. The following incidents have been listed by Athens County Crime Solvers Anonymous as July 2015 Crimes of the Month. The following incidents have been listed by Athens County Crime Solvers Anonymous as June 2015 Crimes of the Month. On April 20th, 2015 at approximately 12:30 PM the owner of a gray, 2008 Ford F-150 4X4 pick-up, parked it in the lot at 929 E. State St, Wal-Mart. Several hours after parking it in the lot, unknown individuals approach the vehicle and eventually drove away in it. The Ohio University Police Department is requesting your information pertaining to several criminal acts which occurred on the Ohio University Campus. On April 18th, 2015 between the hours of 1:00 AM and 12:00 PM an unknown individual(s) illegally entered Building 13 on the Ridges. Once inside the individual(s) rummaged through various offices and stole several items from a third floor art studio. On April 19th, 2015 at approximately 5:00 AM the Ohio University Police Department was notified of an activated alarm at the Jefferson Market manager’s office, which is located in Jefferson Hall. Upon arrival, officers discovered two window panes in the door leading to the manager’s office broken. It was also evident that the individual had injured himself/herself while breaking the glass. Entry was made into the office but it did not appear anything was stolen. Sometime between April 10th and April 24th, 2015 an unknown individual(s) illegally trespassed on the property of Allpower Equipment, which is located at 8880 United Lane. Once on the property, the individual(s) forcibly removed a 2015 Kubota zero turn mower from a shipping crate and then stole it. The mower is equipped with a 21.5 HP Kawasaki engine and a 42” mowing deck. The following incidents have been listed by Athens County Crime Solvers Anonymous as May 2015 Crimes of the Month. The Ohio University Police Department was informed of a breaking and entering on February 26th, 2015 after employees of the South Green mail room discovered the crime. Unknown person(s) forcibly entered the mail room, located at 70 South Green Dr,(MacKinnon Hall) and opened numerous pieces of mail in search of valuables. 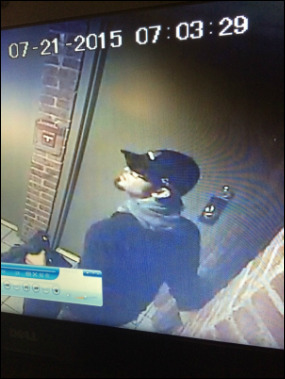 On March 6th, 2015 at approximately 11:15 PM an unknown male forcibly entered the rear entrance door of Mountain Laurel Gifts, located at 25 S. Court St. 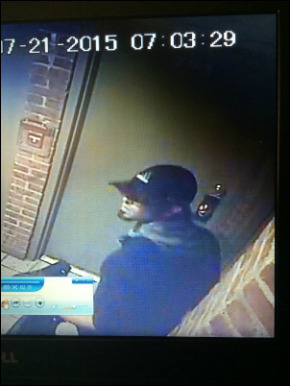 The male spent an extended period of time in the business, stealing a large amount of jewelry. The male placed the items in a unique leather backpack and then fled the scene. Some time between March 9th at 2:00 PM and March 10th, 2015 at 11:30 AM an unknown individual or individuals forcibly entered the front entrance door of Skin Hooked Tattoo, located at 8 N. Court St. The individual(s) stole tattooing and electronic equipment, along with assorted jewelry. The following incidents have been listed by Athens County Crime Solvers Anonymous as April 2015 Crimes of the Month. The Ohio University Police Department is requesting your information pertaining to a criminal act which occurred on the Ohio University Campus. Based on the criminal act, date and time, along with the description of the suspects, these two separate incidents appear to be related. They occurred during Sibs Weekend. On February 7th, 2015 at approximately 11:45 PM an individual walking on Stewart St. and noticed a group of four black males who appeared to be physically harassing a male and a female. This individual interjected and was subsequently assaulted by the black males. As a result of the assault, the victim sustained substantial injuries to his face which required surgery to properly treat. On February 8th, 2015 at approximately 2:00 AM, two hours after the previous incident, another individual was walking on College St at E. Washington St when words were exchanged with occupants of a red sedan. The vehicle pulled over and four black males exited it. Once outside the vehicle, the four black males assaulted this individual. Again, the victim sustained substantial injuries to his face which required surgery to properly treat. The following incidents have been listed by Athens County Crime Solvers Anonymous as March 2015 Crimes of the Month. The Athens Police Department is requesting your information pertaining to a couple of criminal acts which occurred within the City of Athens. The first incident occurred on February 7th, 2015 at approximately 11:45 PM. The victim was walking on Stewart St. and noticed a group of four black males who appeared to be physically harassing a male and a female. The victim interjected and was subsequently assaulted by the black males. As a result of the assault, the victim sustained substantial injuries to his face which required surgery to properly treat. The second incident occurred on February 8th, 2015 at approximately 2:00 AM, two hours after the first incident. During this incident, the victim was walking on College St at E. Washington St when words were exchanged with occupants of a red sedan. The vehicle pulled over and four black males exited it. Once outside the vehicle, the four black males assaulted the victim. Again, the victim sustained substantial injuries to his face which required surgery to properly treat. The Athens and Ohio University Police Departments are requesting your information pertaining to several similar criminal acts which have occurred within the City of Athens and the Ohio University Campus. Between the following dates, January 13th to January 26th, there have been three similar criminal acts involving a male subject following, and on occasion, inappropriately touching the female victim. The first incident occurred on S. Green Dr, the second on E. Union St (Jeff Hill), and the last reported incident on Byard St. Each description provided has the male subject as Caucasian, average to athletic build, college-age, but the height has ranged from 5’08 to 6’00. Residents are asked to be vigilant and report any suspicious acting individuals to police. The Nelsonville Police Department is requesting your information pertaining to a criminal act which occurred within the City of Nelsonville. Sometime between December 13th and December 15th, 2014 an unknown person or persons forcibly entered Runyon Lumber, located at 555 Burr Oak Blvd and stole a 2011 GMC utility truck from the business. This truck contained a large number of tools, tires, and lubricants. The truck was recovered in Nelsonville a few days later but all of the contents had been removed. The following incidents have been listed by Athens County Crime Solvers Anonymous as February 2015 Crimes of the Month. Between the following dates, January 13th to January 26th, there have been three similar criminal acts involving a male subject following, and on occasion, inappropriately touching the female victim. The first incident occurred on S. Green Dr, the second on E. Union St (Jeff Hill), and the last reported incident on Byard St. Each description provided has the male subject as Caucasian, average to athletic build, college-age, but the height has ranged from 5’08 to 6’00. Residents are asked to be vigilant and report any suspicious acting individuals to police. An unknown person or persons stole three riding lawn mowers that were secured outside of Rent To Own located at 743 E. State St. Throughout 2014, similar thefts were reported at various locations in Athens County. Please refer to Previous Crimes - 2014 for more information. The following incidents have been listed by Athens County Crime Solvers Anonymous as January 2015 Crimes of the Month. The Nelsonville Police Department is requesting your information pertaining to a series of criminal acts which have occurred within the City of Nelsonville. On November 9th, 2014 at approximately 1:55 AM, two unknown black males brandishing firearms, forcibly entered the residence located at 1137 Poplar St. They remained in the residence for a few minutes then left with electronics and cash. On November 27th, 2014 sometime between 4:00 PM and 11:00 PM an unknown person or persons forcibly entered the residence located at 475 Jackson St., apartment C and stole a number of electronics and one firearm from the residence.